Apple’s new AirPods appear to take totally wireless earphones one step further than any competitor so far, but we can’t be too sure just yet because of the delayed release and impending launch. AirPods were originally set to release in late October, then Apple said it needed ‘a little more time’ to ensure they’re ready for customers. which lands on the optimistic side and expects AirPods to ship before the end of the year. 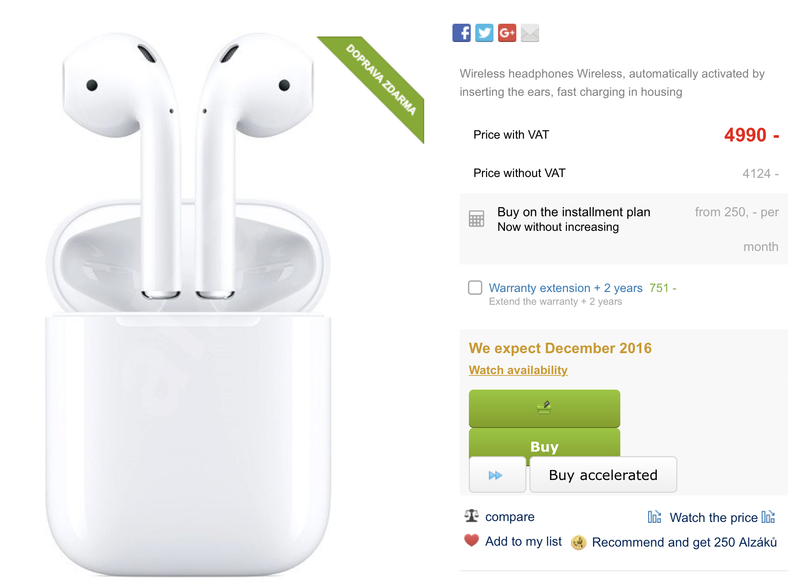 The online listing for AirPods states that the retailer expects AirPods to ship in December 2016, which could see AirPods released before Christmas Day. As ever, take the rumor with a huge grain of salt as online listings are a lot like throwing darts at a dartboard and seeing where they land. A more conservative prediction comes by way of the Chinese supply chain, which expects production to kick off only in time for a January 2017 launch. When AirPods are ready for launch, Apple’s wireless earbuds will promise up to 5 hours battery life on a single charge and power back up through a rechargeable carrying case that promises up to 24 hours of extra battery life. A quick 15-minute charge will power AirPods up for 3 more hours. AirPods work over Bluetooth and feature Apple’s new W1 chip for instant pairing with Apple devices and easy switching between iCloud devices. The wireless earphones will retail for $159, just $10 more than the upcoming BeatsX Bluetooth earbuds (no word on their release date beyond this fall) that connect via a neckband and also include the W1 chip. Early reviews of pre-production AirPods have been mixed, noting convenient access to Siri, mediocre sound quality, and missing volume controls. You can read 9to5Mac‘s AirPods guide for more details including reviews of competing totally wireless earphones already on the market – and stay tuned for more details on AirPods and their eventual launch.